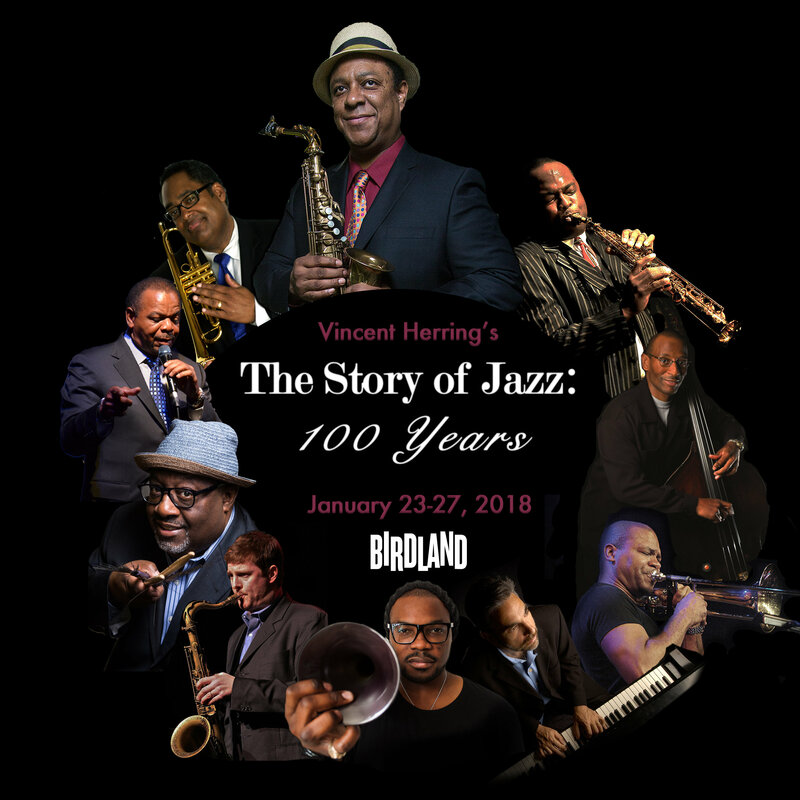 World-renowned saxophonist and bandleader Vincent Herring is proud to present his internationally acclaimed program “The Story of Jazz: 100 Years” to Birdland, located at 315 W 44th St, New York, from Tuesday January 23rd to Saturday January 27th, 2018. Joining Herring is an all-star ensemble including Jeremy Pelt and Jon Faddis on trumpet, James Carter and Eric Alexander on tenor saxophone, Robin Eubanks on trombone, Mike LeDonne on piano, Kenny Davis on bass, Carl Allen on drums and Nicolas Bearde on vocals and narrations. They will perform newly commissioned arrangements of classic jazz compositions written by prominent artists from each decade of jazz history from 1917 through the present. Celebrating a century of jazz, this melting pot of highly-accomplished musicians will take to the stage for two sets each night (8:30 pm & 11:00 pm). Tickets are available here. A musical journey celebrating 100 years of America’s original art form begins with the African drumming and work songs that led to the birth of the blues ­– the basis of jazz. The show moves through 1920’s Ragtime, to 1930’s Swing, to 1940’s Bebop, to 1950’s Cool. In the 1960’s, jazz explodes with innovation: The Hard Bop of Miles Davis and Art Blakey, the Modal Jazz of Miles Davis and John Coltrane, Soul Jazz, the Bossa Nova craze, Latin Jazz, and Free/Avant-Garde sounds of Ornette Coleman. The program concludes with 1970’s Fusion and the many Post-Bop iterations from the 1980’s to the present. Saxophonist Vincent Herring’s intense, soulful, multi-noted style and ebullient swing have excited audiences worldwide. On stage, Herring and his band often make an incendiary sound over fine and controlled rhythms of modern times. For The Story of Jazz: 100 Years, these talented musicians will collectively present a dynamic set of reimagined jazz classics. However, each of these artists have become highly respected in their own individual careers. Herring, one of the most distctive alto saxophone voices of his generation, has just released the astounding album “Hard Times” on Smoke Sessions Records. Currently peeking at in the top five on the Jazz Week Radio Chart, “Hard Times” has received widespread critical acclaim. Vincent Herring is thrilled to bring The History of Jazz: 100 Years back to Birdland after last year’s popular five-night engagement. Tickets will surely go fast so RSVP today for a chance to witness more jazz history in the making. ← Kathy Kosins Joins the Maria Matias Music Family!